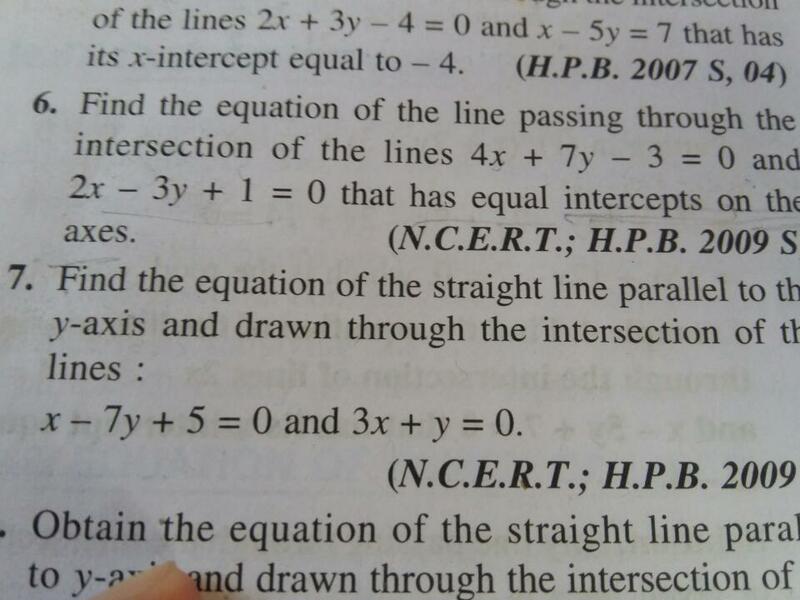 Solve Question Number 50th both AandB? Find the vertices of a triangle midpoint of whose sides are (3,1), (5,6)and ( - 3,2)? Find the equation of the line passing through (5, 4) and perpendicular to the line through the points (3, 7) and (- 4, 8). The perpendicular from the origin to a line meets it at the point (3, –7), find the equation of the line. Find the equation of the circle which passes through the points (2,-2), and (3, 4) and whose centre lies on the line x + y = 2. In what ratio, the line joining (-2, 3) and (3, 5) is divided by the line 2x + y = 5. 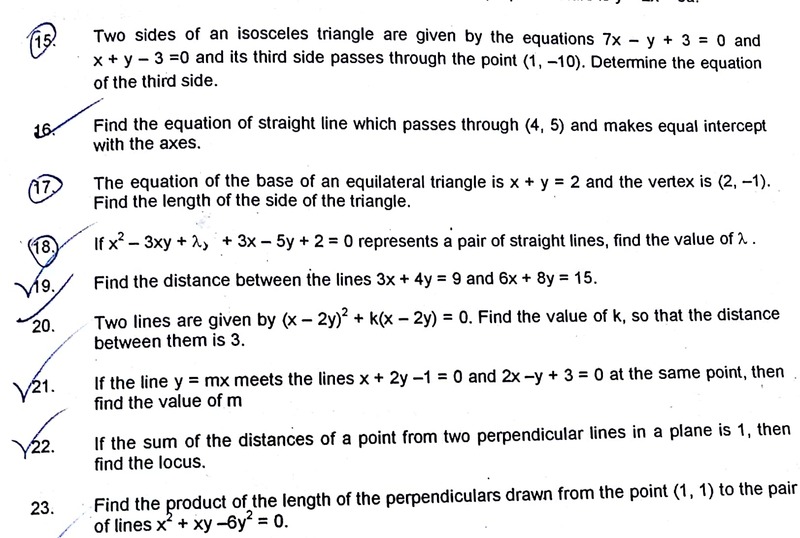 Find the equation of line drawn perpendicular to the line , through the point where it meets the y-axis. a line L is drawn from P(4,3) to meet the lines L1: 3x+4y+5=0 and L2:3x+4y+15=0 at point A and B respectively. From A a line perpendicular to L is drawn meeting the line L2 at P. Similarly from B a line perpendicular to L is drawn meeting the line L2 at Q. Thus a paralleogram APBQ is formed. Find the equation(s) of L so that the area of the parallelogram APBQ is least. P and Q respectively. Find the ratio in which the point O divides the line segment PQ. The midpoints of the sides BC,CA & AB of a triangle are D(2,1),E(-5.7) & F(-5,-5)respectively. Find the equations of the sides of triangle ABC. Find the equation of the line perpendicular to the line whose equation is 6x - 7y + 8 = 0 and that passes through the point of intersection of the two lines whose equations are 2x - 3y - 4 = 0 and 3x + 4y - 5 = 0. Find the co-ordiantes of the foot of the perpendiculr drawn from the point (1,-2) on the line y = 2x + 1. 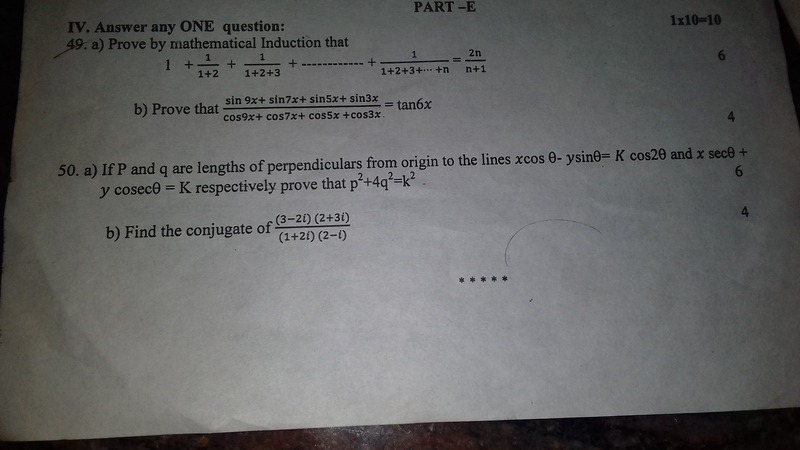 Find the equation of the line which passes through the point (3,4) & the sum of its intercepts on the axes is14. Find the equation of the lines which cut off intercepts on the axes whose sum and product are 2 and - 8 respectively. If the lines 3x - 5y + 3 = 0, 5x + 7y - k = 0 and 2x - 3y - 5 = 0 are concurrent, find the value of k.
Find the equation of the line passing through the point of intersection of the lines 5x - 2y + 7 = 0 and 3x - 4y - 5 = 0 that has equal intercepts on the axes. Find the equations of the lines through the point (3, 2) which are at an angle of 45o with the line x -2y = 3. If three lines whose equations are y = mx + a, y = nx + b and y = px + c are concurrent, then show that m (b - c) + n (c - a) + p (a - b) = 0. Find the equation of a line which cuts off an intercept of length -8 on y-axis & is parallel to the line joining the points (-3,2) & (-1,4). Prove that the three points (3, 0), (-2, -2) and (8, 2) are collinear.